Overlooking the crashing cerulean waves of the Arabian Sea, Le Méridien Mina Seyahi Beach Resort & Marina is a jewel set in the modern, vibrant, and cosmopolitan city of Dubai. 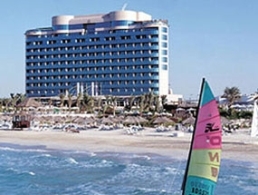 Le Méridien Mina Seyahi Beach Resort is located opposite the world-famous Emirates Golf Club and Montgomery Golf Course. The splendid natural surroundings and the rich cultural attractions that Dubai and the United Arab Emirates have much to offer. The Latitude number of the bar stems from the hotel’s position on the globe, meaning that each bar has its own unique number.